First exhibited the year Carlyle was elected an associate member of the Royal Canadian Academy of Arts (R.C.A. )—a rare distinction for 19th-century women—this portrait evolved from sketches made in France in 1894. Mère Adéle gave Carlyle room and board while she made portraits of Breton villagers and conducted sketching trips nearby. In her youth, Mère Adéle may have been a model for Jean-François Millet’s painting The Angelus, a depiction of two peasants in a potato field that became a widely-admired example of French Realism. Carlyle’s portrait of Mère Adéle owes much to Realism as Millet had practised it. Her “lowly” subject is bent with age, tired, yet dignified. She is also an individual rather than a type. 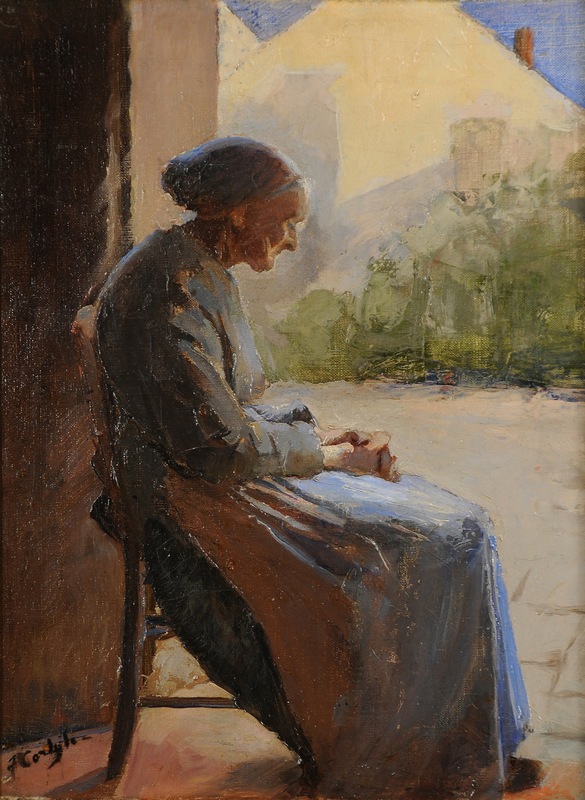 Unlike Millet, however, Carlyle avoids sentimentalizing her subject and uses a looser, more gestural style. Visible brushstrokes and blocks of colour suggest skin tone and shade rather than define it. Carlyle travelled widely during her 58 years. Born in Galt, Ontario, she lived, “Bohemian style,” in New York, and frequented Paris and Italy between periods in Woodstock, Ontario. She eventually settled in England, having struck her own path as an independent professional artist.